The Gosport Ferry carries over 3 million passengers a year offering a route to market for local and national advertisers through digital display advertising and poster and banner sites on its three ferries and two passenger pontoons. The Gosport pontoon (pictured below) features two 47 inch HD (High Definition) screens for video and stills-based advertising, vinyl on aluminium backed banners, framed A1 posters and overhead hanging banners. On the ferries and the Portsmouth pontoon there are framed A2 poster sites. The Portsmouth pontoon also has vinyl aluminium backed banners and framed overhead banners and is the only location which can also display traditional PVC banners. The Gosport Ferry offers the best value-for-money local advertising to a large and diverse audience of commuters, shoppers and tourists of all ages and incomes. 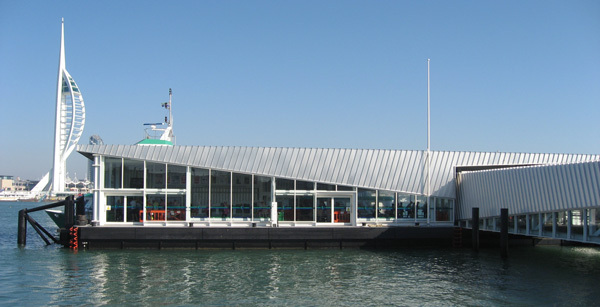 Gosport Ferry is a vital part of the Gosport/Portsmouth transport hub with its pontoons adjacent to the busy Portsmouth/Isle of Wight ferry service, the Portsmouth Harbour railway, coach and bus stations and the Gosport passenger interchange. Gosport Ferry has been in existence since 1875, linking Gosport and Portsmouth through a journey across Portsmouth Harbour that now takes only four minutes. The service runs every day except Christmas Day from 5.30am until midnight. Two ferries operate in peak times (weekdays 6.30am - 9.30am and 3.30pm - 6.30pm) and on Saturdays (11am - 6pm) with a single ferry running in the off-peak periods.